Reduce Form. Abstract Design! Depersonalize art! Re-conceive the environment! Explore new plasticity! This is exactly what Dutch painter, designer, architect, and critic Theo van Doesburg did when he founded an art and design movement called De Stijl in 1917. De Stijl, meaning ‘style’, depersonalized art, the object and architecture. Doesburg published a journal called De Stijl, presenting the movement’s new objective aesthetics and theories between 1917 and 1932. Composition in De Stijl was accomplished through proportional relationships between colored and uncolored forms and closed and open forms. The painter Piet Mondrian created compositions of straight lines framing red, blue and yellow primary colors. Designer and architect Van Doesburg transferred abstract and anonymous principles of De Stijl paintings into interior spaces of houses and to entire city plans. De Stijl influenced teachings at the Bauhaus in Germany in the 1920’s. Study Piet Mondrian’s paintings. Look at the closed forms and the open forms. Consider how the black lines divide the composition into parts. Collect your materials: primary construction paper, white construction paper, black construction paper, glue and scissors. First cut out one really big red square (app. 4” x 4”), a medium size blue rectangle (app. 2” x 4”), a small yellow square (app. 2” x 2”) and 7 black lines approximately 1/4” wide. Now experiment with different compositions. Make your compositions fit within 8 ½ x 11”. When you find a composition that you like, glue the lines and colored squares on a white piece of paper then glue your De Stijl composition in your journal. 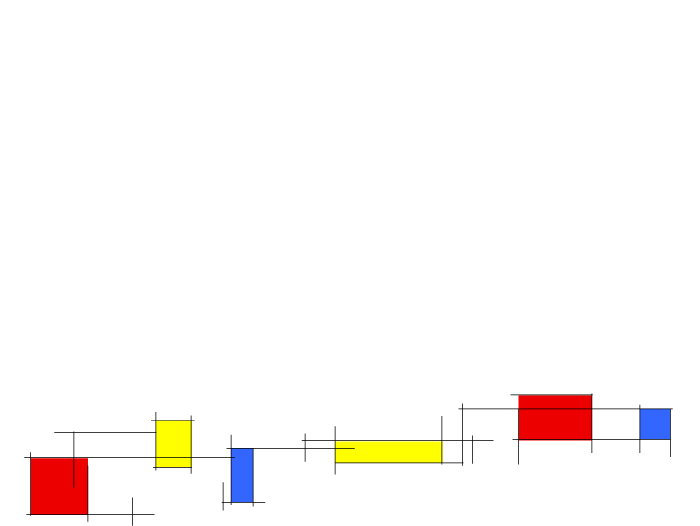 Now make a second composition that uses at least 15 black lines composing large white spaces and medium and small red, yellow and blue rectangles and squares. Glue the paper onto a 8 ½ x 11” page of paper and put in your journal. Study the front elevation of the Reitveld-designed Schroeder House. Find the basic geometric shapes. Add new geometrical shapes- rectangles and squares of your own and cut theses shapes out of colored construction paper. Compose a new elevation of a house. You can use colored lines as well to accent your composition. Prepare your composition to fit onto an 8 ½ x 11” page of paper. Paste your composition in your journal. Orthagonal explorations done by hand, can also be created digitally. Watch the video on Compositions and then open Compositions and try your hand at creating different two dimensional arrangements using the same black lines, yellow and red and blue squares and rectangles. 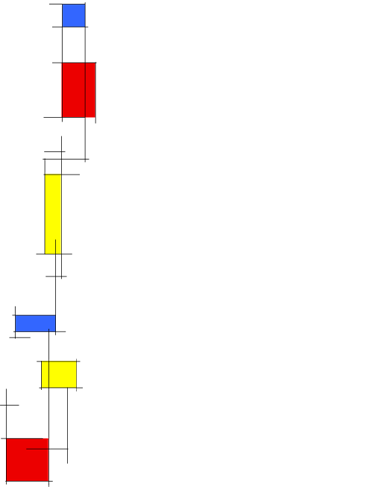 Many artists and architects contributed to DeStijl. While Theo van Doesburg is considered the leader, the group’s other principal members included Piet Mondrian (1872–1944), Vilmos Huszár (1884–1960), Bart van der Leck (1876–1958), and the architects Gerrit Rietveld (1888–1964), Robert van ’t Hoff (1887–1979), and J.J.P. Oud (1890–1963). Research these other DeStijl contributors. Document asymmetrical patterns designed for paintings, fabrics, objects, windows, interiors and architecture. Write a paper about their contributions to the style DeStijl and their experimentation with abstract orthagonal geometry and primary colors. What colors are mainly used by the De Stijl painter, Mondrain? How could a 3-dimensional effect be achieved in the paintings? De Stijl theories of plasticity and simplicity were realized in _________. Is a rectangle with black borders on three sides considered an open or closed shape? 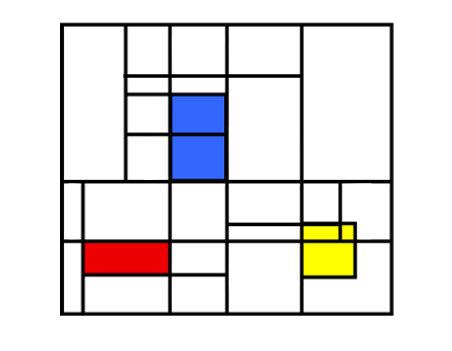 TEDed Can You Solve the Mondrian Squares Riddle?